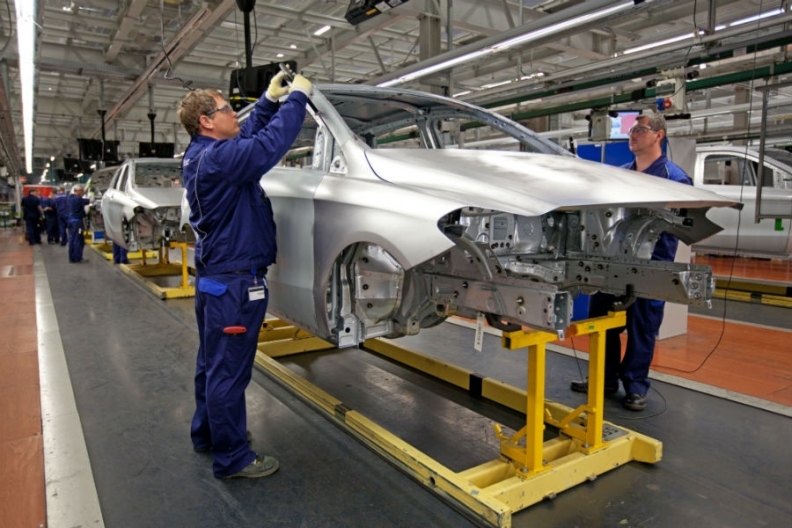 Daimler aims to raise profitability by building the Mercedes B class and CLA in its new plant in Hungary, shown. Hungarian workers are paid a fifth of what their German counterparts demand. KECSKEMET, Hungary – Mercedes-Benz said it will build a coupe-styled compact premium car at its new factory here, alongside its B-class model. The four-door sporty sedan will be called the CLA and will debut as a concept at the Beijing auto show in April. The sedan has been dubbed a "baby CLS" after the larger CLS car launched by Mercedes in 2004. The CLS created a niche for coupe-styled four-door sedans that Audi, with the A7, and BMW, with the 6-series Gran Coupe, have since joined. "In April in Beijing, we will show the concept of what we call style coupe," Mercedes sales and marketing director Joachim Schmidt told an investor conference on Thursday at the opening ceremony of the new plant in Kecskemet, about 100km south of Budapest. Daimler CEO Dieter Zetsche said the automaker will improve the profitability of its compact cars by expanding the lineup from two models -- the A class and B class -- to five cars and building signiciantly higher volumes. Mercedes plans to add SUV and shooting brake versions to the range. Daimler has invested 1.4 billion euros ($1.9 billion) to build a new generation of compact premium cars in cars in Hungary, Germany and China. The automaker spent 800 million euros to build the Kecskemet plant and 600 million euros to expand its factory in Rastatt, Germany. Combined, Kecskemet and Rastatt will have an estimated capacity of about 450,000 vehicles, which would be equivalent to 35 percent of Mercedes car sales this year, according to data from IHS Automotive. Daimler did not say when it will begin building the CLA, although press reports say production of the car will start at the end of the year and that it will arrive in showrooms early next year. Mercedes said it has so far received more than 100,000 orders for the B class since its launch in Europe in November 2011. The B class is built in both Kecskemet and Rastatt. The new A class, built in Rastatt, will go on sale in Europe in September and is scheduled to arrive in the United States in 2014. With Hungarian workers paid a fifth of what their German counterparts demand, Daimler needs the factory to meet its goal of boosting sales 27 percent to at least 1.6 million vehicles by 2015, while at the same time raising profitability for its smaller models. Cheaper production costs should help Mercedes boost profit on the vehicles. The Daimler car unit intends to lift its operating profit margin to at least 10 percent of sales in 2013 from 9 percent last year. "Adding capacity in the premium segment makes sense, as car buyers are either moving upmarket or heading down-market," said Michael Tyndall, a London-based auto analyst with Barclays. "The problem for the mass-market carmakers is they expanded into eastern and central Europe without closing western factories, so they've created their own problem to an extent." "We are on the offensive," Zetsche said at the Hungarian plant's official opening. "Our entire team is focused on reclaiming the leadership position." To reach this goal, Mercedes plans to grow at "above-average" rates in markets such as China, India and the United States by tailoring cars to local markets and expanding sales networks, Zetsche said. The Hungary factory will add to car-making excess in Europe, where auto sales are poised to decline for the fifth consecutive year in 2012. The slump means that the region's carmakers will probably use about 65 percent of total production capacity this year, down from 71 percent last year, according to LMC Automotive. The unused assembly lines could manufacture about 10 million vehicles, the market researcher said. With that backdrop, people in Kecskemet are thankful their area was selected as the site of the Mercedes factory. "We're the envy of the region," said Klaudia Pataki, deputy mayor of the city of about 110,000 people on the sandy plains of southern Hungary. "This investment has definitely changed the strategy and image of the city for at least 50 years." Mercedes is following Audi, which has manufactured motors in the western Hungarian city of Gyor since 1993. Audi began building the 30,500-euro TT coupe there in 1998 and is investing 900 million euros to expand annual capacity to 125,000 cars by next year from 38,500 in 2010.